Worshipful Brother David Holyhead enjoyed his year so much that he decided that he would go around again, much to the delight of the Brethren. Accordingly Mark Masons assembled from the four corners of the Province to witness the Proclamation, at Wellgate, Rotherham on Thursday, 21st March. Before this could take place, the Lodge was opened in due form by W.Bro.David and , upon a report, the Provincial Assistant Grand Director of Ceremonies , W.Bro.John Gray was admitted and he then escorted the Provincial Grand Senior Warden, W.Bro.Mark Holland and W.Bro. 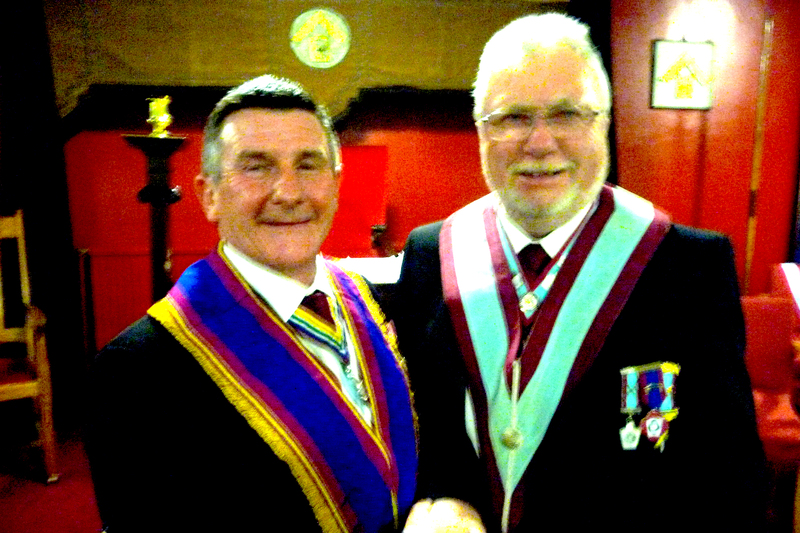 Paul Leach, Elected Member of the Charity Committee into the Lodge. Both were welcomed by the W.M., took their seats and the Ceremony commenced,. 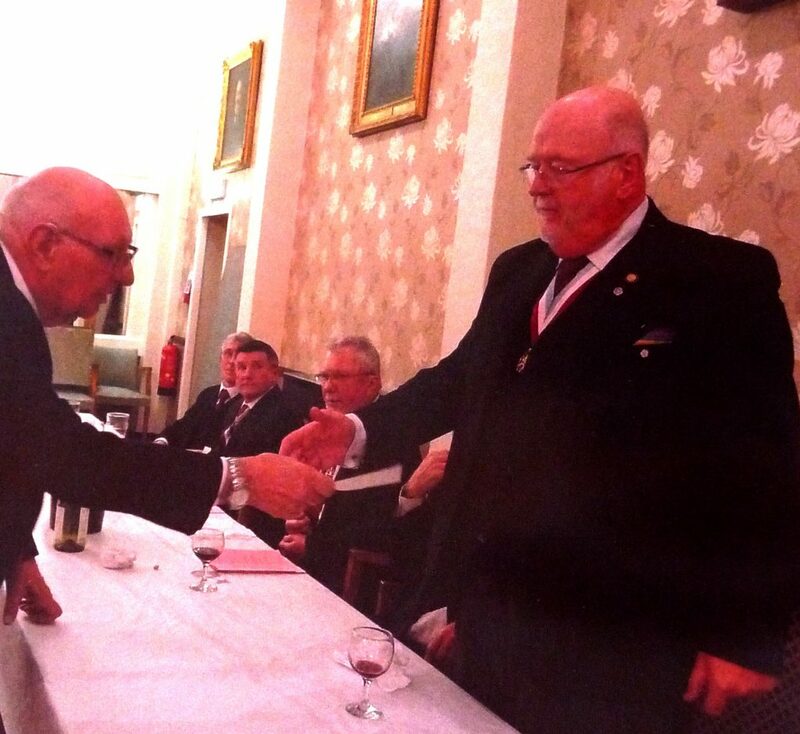 This was conducted in a most professional manner by the Director of Ceremonies, W.Bro. Stephen Flethcher, short and simple whereupon the Officers for the ensuing year were Appointed and Invested, no surprises there, The Addresses at a Proclamation exclude that to the Worshipful Master, the remainder were dealt with as follows, the Wardens by V.W.Bro.John Morgan, the Overseers by W.Bro.Michael Speight and the Brethren by W.Bro.Mark Holland, all delightfully submitted, A past Masters Jewel was then given to W,Bro,David by Worshipful Brother Terry Beatson who thanked him for a positive year, one candidate and hopefully another to follow. The remaining business dutifully covered, all adjourned to the Festive Board, a delightful conjunction of Pate, Chicken breast with roast potatoes and vegetables, finished off with, I think, Poire Belle Helene where I indulged for one of the very few times, delicious. W.Bro.Ron Cooke presented the Toast to the Province emphasising the commitment, dedication and service of the Provincial Officers and , particularly those in his own Lodge for which we are truly grateful. W,Bro,Mark began by congratulating the members of the Lodge who will be honoured at the Provincial Meeting on the 13th April, stressing that it would be nice if some of their colleagues attended to give their support. He hoped that W.Bro.David would have a successful and happy year, suggesting that one of the best ways to ensure this is to visit yourself, This encourages others to come to you, a message that has been sung from the roof tops and yet there was only one visiting Master out of the whole of South Yorkshire; well done W.Bro.Matt Brelsford from Aire Ferry. Mark did point out that regular visiting can have a price to pay, being called up to sit in as Senior Warden, where? Rother a few months earlier. The Charities Toast was skilfully negotiated by W.Bro.Roy Bury. The donation of six hundred pounds to the W.Y.M.B.F.F. acknowledged by W.Bro Paul in his reply but with a note of caution, the number of Brethren now supporting by regular standing orders is somewhat below 30%, examine your situations and see if you could give more. Recent awards by the M.B.F. have focussed on saving lives, Mobile Chemotherapy units and St John Ambulance vehicles, who would not wish to support such worthy causes. The Toast to the Visitors was submitted by W.Bro.Michael Speight who trusted that all had enjoyed the proceedings and would grace the Lodge with their company again in the future. This was confirmed by W.Bro.Charles Lindsey responding, ‘Good food, Good Company, entertainment and Ritual of a high standard’, nothing more to say and this time he didn’t. A wonderful atmosphere throughout, Mark Masonry at it’s best. Brethren Smile, be happy, we are all Mark Master Masons.